The No 1 Light Sporter Single Shot made by Ruger is a single shot series rifle with class and the designers have paid a fine attention to detail making this a very expensive but well built single shot. 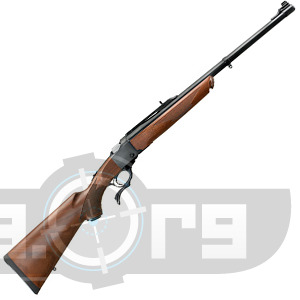 With an MSRP of around $1300 set by Ruger the Light Sporter Single Shot with it's 22" barrel, and 38.50" overall length this gun is not being marketed to the youth but rather the older more mature rifleman who wishes to hold something a little more high class. This gun comes in the following calibers; .243 Win., 6.5 Creedmoor, .270 Win., .30-06 Sprg.,243 Win, 65 Creedmoor, 270 Win, 30 06 Sprg, 300 rcm, 303 british, 308 win. Caliber: .243 Win. 6.5 Creedmoor .270 Win. .30-06 Sprg.